Causeway Koi Scented Candle - small. 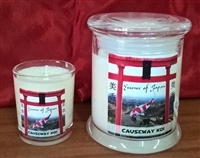 Our own "Essence of Japan" candles are available in 2 sizes - the full size will burn for 50-70 hours. The smaller boxed candle will burn for approx. 25 hours. A pleasant floral scent of Jasmine, our candles are made from a natural beeswax blend and coloured using only the high quality fragrances that this candle is made with. 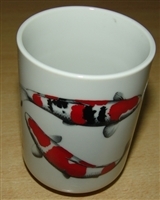 Japanese Koi Cup. From Ojiya, Niigata. 7cm dia. Beautiful porcelain mini koi (9.5cm long) from Ojiya, Japan. A pleasant floral scent of Jasmine, our candles are made from a natural beeswax blend and coloured using only the high quality fragrances that this candle is made with. 1 bowl - dia. 12cm & 1 cup - dia. 6cm.